This translation was made from the text published in the collected edition of the poetry of Vytautas Mačernis, Poezija, edited by Kazys Bradūnas and published in Chicago in 1961. This edition also contains an appreciative essay by Alfonsas Nyka-Niliūnas, a friend of Mačernis and a fellow poet. The present translation of the Visions is published to commemorate the twenty-fifth anniversary of the death of the poet. 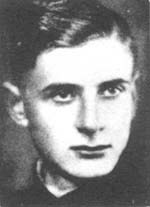 Mačernis was born in 1920 in the village of Šarnelė and died in 1944, probably from wounds inflicted by a stray bullet. Thus, at the time of his death, Mačernis was hardly beyond his student days. He had studied English language and literature in Kaunas and philosophy at the university of Vilnius. In his essay, Nyka-Niliūnas, a participant with Mačernis in the same literary movements recalls something of the atmosphere in which the Visions were written. A group of little known students were trying to break away from the more established poetic traditions of independent Lithuania. The foundations of this break were various, among them a familiarity with the existentialist current in philosophy then becoming prominent in Europe. Mačernis enjoyed a special advantage: his knowledge of the English language and familiarity with English and American literature, particularly the work of Edgar Allan Poe. Most Lithuanian writers were more familiar with European sources and, thus, Mačernis had a vast and at the time novel body of literature from which to draw. So very alien and restless. And like a traveler knocks at the door. Those men, young and full of promise. And the agony of creative men. To the home burning with sun. And its ringing so happy and sweet. It slowly oozes into the heat. Spatter in honey on the boughs. I hear thundering somewhere far away. And to revive the fields. And the trees begin to wake. And the crashes keep echoing. The storms quieten, as if a drained out spring. Across the dewy meadows twilight comes wading. And the song of the thrush proclaims the orchards. Soon it will be evening: father returns home from the field and the dogs come running across the yard. The smoke of supper from the red chimney sprawls along the ground. And in warped windows the last lights end their play. It is calm in my birthplace. Through the maples the moon gazes at the yard. The night is beautiful and divinely bright. And the heart beats frightfully. And the farmer's steps echo about the house. A sweet trill strays toward me. Seeps to the deepest depths of my heart. Frightened of the morning light. To burn with the flame of visions. Fluttered in the morning wind. That this was the scarf of my grandmother long dead. With clear, clear eyes like two deep lakes in the mountains. With cold, cold drops she moistened her brow and lips. White, white, rolled like two small boats at sea. Her eyes so clear and blue, like two deep lakes in the mountains. From her fingers, lifted up toward heaven in ecstasy. Had stayed to tend the house. Long dwelled on the sun's window in the floor. Veiling for me bright joy and reveries. And crying fell into her open arms. Forming for me a bright window of sun in the floor. Many years passed. And grandmother died. And throws the shadow of huge wings into the center of my happiness. It will never return here, never. Embraces my days of work and torment. From rivers a warm wind blew back. When I, intoxicated in the sunbeams, walked through the earth in bloom. Hovered the peace of a big harvest. Their bronze faces and cold eyes blazed with the beauty of freedom and power. Their souls — clear and bright like those of little children. Will bend their proud heads fearlessly to death. Live through us, so we can live eternally through you. Turned to warm southern lands. And came to the city. While the evening which had come with me, with long shadows covered the parks and streets. Of passers-by, who hurried past me full of strange hopes and unrest. They carried boredom in their faces and secret hatred in their hearts. Bent under the day's load. Like a bit of dust in the street's, I adapted to the carrying stream. I could no longer find new hope. Which sprinkles with cold rain the mournful, wilting flowers. I came to like destroying in myself my growing powers. And so the last fires of joy died out, while in the soul was born a longing for the end. On an autumn night run across space and fade away without meaning. Poured out a stream of images of the future. Flamed the hills and fields of my birthplace of plowmen. Somewhere far-off was heard the exuberant song of plowmen. And fog, like a white flower, swirled above the meadows. And in the twilight shone grandmother's smile. The whitest petals like small butterflies fall into the grasses. Intoxicate me as if with wine. And fallen apple blossoms stain her dress. Come closer and sit down. So many days I waited here, gazing down the road for you. Tell me, did you not tire in the world? Tell grandmother. Comfort her days, full of waiting and sorrowing." We liked walking in the fields, just the two of us." To alight on the other side of the lake, too lazy to fly further. Would sail to the farthest shores of the lake. No one knows what will become of you." The blossoms of one sorrowing spring, pressed in a book. Longing floods my dimming eyes. I was without care, and smiling gazed at the lot of those who work. Having fled to the edge of the woods, bright and youthful birches budded with leaves. Being restless without end, I rushed about among my friends. All of us followed, playing pranks, the sunny river of time. And tossed them into the water; let the rolling waves carry them along. Where the smoke of a shepherd's fire rose skyward. Then night would come, scattering stars across the sky. And their high and noble serenity would enslave us. When I handle them in the books of memory. Later, fate parted us and the years added gravity to our faces. I set my clear eyes upon a book. While a ray from the autumn sun played on my face. Here evening had suspended in the heavens the colors of a fading heaven. And how tramps were singing their sad songs. Shall find only the unknown and death. I wish to forget happiness and devote my hands to work. Then hung her head and long sat in silence. Tell me, how could I help loving you? And found you in the rye field... All of you asleep, in one heap. And the land of our fathers will be beautiful..."
Raised their large, firm hands, as if in prayer. Whispered: "Your happiness is on the way..."
A joyful mood flooded the home of my forefathers. And a marvelous laughter could be heard. Smiled again with mysterious smiles. And secretly aroused an intoxicating tremor. Spilled intoxicating scents in streams. Murmured about the miracles of happiness. Only in deep midnight all the lights closed like tired eyes. And in my heart still trembled the pure light of that evening. Drew me like a bewitched reverie. About the flower of kings blooming in the east where the sun rises. Ringing ever closer, like a swarm of golden bees. Aroused in me a longing for the blue distances. Believing the marvelous words of the legend. Ruffled birds stirred restlessly in their nests. And the milky sun climbed slowly up the cloudy sky. Again pushed away the lands of legends and dreams. And every evening tear up the bonds and screws of the everyday. Where the wind flows warm and refreshing. And on the horizon see the flames of the blessed east. Someday I shall return again to the home of my ancestors, carrying in my arms the flower of the kings. Come to the festival of the blessing of the earth. And breathe into you love for the unseen sun. Rigidly staring at the fading scenes in my soul's hearth. This night seesaws its tiring wings above the emptiness. Full of terror, throw themselves into the sad depths of sin. Not for them to pass the earth with a haughtily quiet step. Slowly strives ahead a new generation of giants. Will never shine for it through the thick clouds of unknowing. And finally closes in darkness the eyes which longed for light. And I rise, slightly open the door... the darkness breathes upon our faces. Already underneath my feet thunders the road leading to the great heights.